Just a few weeks after its Lightroom 4 launch, Adobe has announced the release of Photoshop CS6 beta, giving users the chance to get their hands on all of features that are packed into the next major release. The beta is available for download for free from Adobe Labs. Along with a few changes under the hood, making Photoshop a little bit faster, a few tweaks to the UI, darkening it and bringing it in line with its suite of tools including Lightroom and Premier Pro, and a great new migrating tool making it easy to import all of your Photoshop presets into the new version, it also has some really cool new editing features that you’re going to want to try straight away. Available for both Mac and Windows, the new features have been described by Adobe as magical, and when you see them in action, we’re sure you’re going to agree. With its Content-Aware technology, Photoshop just made it a lot easier to manipulate your images so that the final product looks exactly the way you want it to. The new Content-Aware Move feature allows users to select and move objects from one place to another in an image, and Photoshop deals with cleaning up the empty space left behind, as if there was never anything there in the first place. You simply select the part of the image that you want to move, drag and drop, and Photoshop will do the rest. 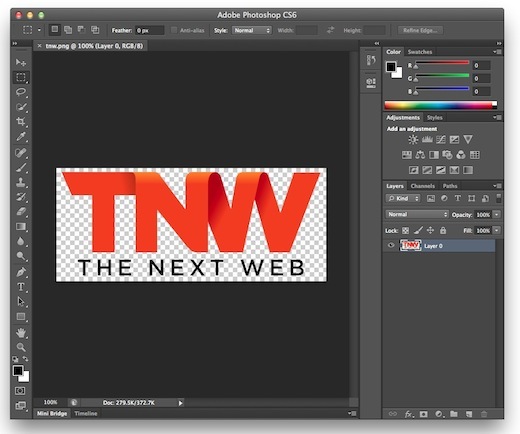 That’s not the only new Content-Aware feature that you’re going to get with CS6. Adobe has thrown in a little bit of that Content-Aware magic into its patch tool as well. Say you’ve straightened an image using the Free Transform tool, and that’s left an empty space in the corner of your image, or there’s an object in you want to remove completely. With the Content-Aware Patch tool, Photoshop knows how to fill in that space for you, making it look realistic, and no one will be the wiser. Select the section of your image that needs to be filled in or replaced, and then select the part of the image that Photoshop can use to source the details, and it will blend the pixels for you. With Photoshop CS6, 3 new types of ‘blurring’ have been introduced to the Filter menu. Iris Blur will let you fake shallow of depth in your image, which means that you now have the ability to choose the focal point after you’ve taken the photo. Take that Lyto. Adobe has also finally given its users an easy way to create tilt-shift images. With the new Tilt-Shift Blur feature, Photoshop automatically selects the sections of the image that have been blurred, after which you can adjust the blur strength and its positioning. This might not sound like a big deal, but anyone who has to use Photoshop on a regular basis is going to love this new feature. If there’s one complaint that we hear all the time about Photoshop, it’s how it can sometimes slow us down. Not only is Photoshop that little bit faster under the hood, the new Background Save feature means that your work flow will no longer be interrupted. Instead of sitting there and watching as Photoshop slowly saves an image, the process now takes place in the background, meaning you can move onto other images straight away. Adaptive Wide Angle is another great feature available under the ‘Filter’ menu which allows you to magically straighten and tweak images, without having to crop away content that might have been distorted by a wide angle or fish eye lens when you took the photo. While CS5 does have a few video editing features to speak of, it’s not really anything that’s going to blow your socks off. With CS6, the features have been enhanced, and what’s really cool about it is that it is the perfect marriage of Photoshop image editing features, alongside the video editing tool. You can add textures and filters, and edit the images to your hearts content right there within the video editing panel. You can also add audio, graphics and text, drag and drop fade effects and add motion controls to pan and zoom images. The process is also extremely easy to use for anyone who is familiar with Photoshop’s layer feature, as images are grouped within each Video as separate layers. The new features make the software an all-in-one option if you don’t want to splurge, or don’t need the advanced features that Adobe Premier Pro provides. Want to see what the final product can look like after you’ve put some Photoshop video magic into your images? Check out the video below. The beta is available as a free download here, in both English and Japanese, and includes all of the features available in Photoshop CS6 and CS6 extended. The final release will be available in the first half of 2012, at Adobe’s standard prices of $699 for CS6 and $999 for CS6 Extended. A full list of Photoshop CS6’s new features are available in this PDF.